With the Denver Broncos biggest game of the season just a few days away, you might already be making plans on how to hang out with your friends on Sunday. Let's say, however, that you all live in various parts of the country (or the world for that matter). That makes it pretty impossible for you and your buds to watch the game together. Thanks to FanKave, that won't be a problem this weekend. You can think of FanKave as a virtual living room where you and your friends and family can follow the game together in real-time while cheering on the Broncos and talking smack about Tom Brady and the Patriots. 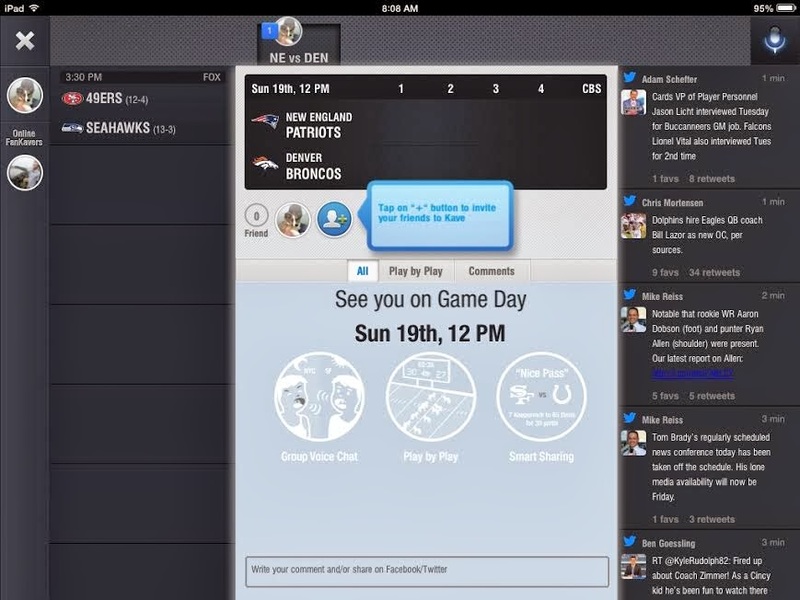 Fans can cheer and trash talk via text or use the audio feature so everyone can talk to each other at once. There are a few other cool features as well. There's a Twitter feed that constantly updates on-screen with info, stats, and other tidbits from popular sports writers. FanKave also eliminates the need to have other tabs open on your iPad for your Twitter and Facebook accounts. Each time there's a big play in Sunday's game that you want to brag about, simply update your social media accounts from within the app. Super easy! Go check out the FanKave iPad app by clicking here. In a few weeks they'll have NBA as well as college hoops - just in time for March Madness - and later this year the app will be available on iPhone and Android - so stay tuned.